Hi, i dont know where to post a general Nicehash or mining commend so i chose here. 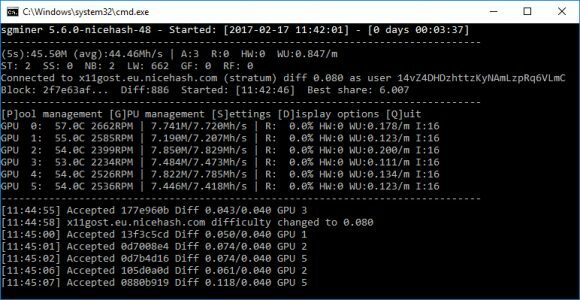 I just got a new Radeon RX470 card and it was mining so nicely for a few days non 24/7 though . My ethereum speed was 24MH/s no overclocking stuff and my zcash speed was 280-290 odd solutions/s. I have been fanning the room but the temperatures mostly got to 73 degrees but its starting winter now here in the south so i barely get 70 it sits at 69 with Zcash and maybe 71 with ethereum i dont know why the one is hotter. My mining earning was like 1.85 USD to 2.09 and i dont know but now all of a sudden this weekend its been horrible, my earnings are like 1.55 to 1.65 i dont understand what has gone wrong, is my card faulty now and old a moldy ? like it is hurt or something? I am sure I have installed the correct drivers…and I am running windows 7 64 bit. I have been uninstalling and re-installing drivers… and i have been rebooting. i dont understand it, but my earnings in Nicehash says 1.52 now on the GPU alone. i dont get it really i dont i feel sad now. The other day it was pumping and it was showing 2.19 for the GPU alone …it was like super amazing. The 30-60 odd cents means a lot to me. Please help me understand what I am doing wrong and or if my dream is over ? I just bought another Rx470 so i hope this is not just a waste now. When I try to start the miner I got this error: WARNING: Number of OpenCL and ADL devices did not match! Also Windows detect the sgminer as a virus and delete it. Any insight about that? This download is flagged by about 50% of virus scanning engines as being a trojan/dropper. I recently tried mining x11gost on a rx580 8G. After using a simular setup I am only getting 1-2Mh/s not the 7Mh/s that you are getting. Can you give us an example of the settings that you are using? Are you still getting these kind of hash rates?